Alexander Ludwig | TV, eh? “It’s the best season we’ve ever done, I think. As an audience you’re going to be super invested in these characters and they’re so on the fringe of destruction internally and externally. As a fan myself, it’s just constantly a cliffhanger and it can be very troubling as well.” Continue reading. “Björn is going to have to make a decision — a political decision — based on his incredibly strong emotions toward his uncle and the future of his people.” Continue reading. It seems unthinkable to sign on to a television series based on what will happen several seasons in the future. There’s no guarantee a program will last one year, let alone several, so it’s a gamble. But that’s exactly what Alexander Ludwig did when he became part of Vikings. With the latter half of Season 4 returning Wednesday at 9 p.m. ET/PT on History, Ludwig praises creator Michael Hirst with coming through on his promise big-time. Fans will follow Ludwig’s Bjorn Lothbrok as he sails new boats—designed, of course, by Floki (Gustaf Skarsgård)—into the Mediterranean and to Africa. He’ll also establish himself as an individual, distancing himself from Ragnar (Travis Fimmel) and evolving from the lovable dude we’ve seen into a more ruthless leader. “I grew up with this character and people are so invested in him, it’s just cool to be a part of it,” he says. Ludwig jokes things could have been very different if anything had gone wrong earlier in production when Bjorn went toe-to-toe with a bear while on his lone survival journey. Whopper, his ursine co-star, was just feet away from Ludwig and just a clothesline between them. As the Vancouver native tells it, Whopper believed the clothesline was electrified. It wasn’t. Filming took place in March outside Sault Ste. Marie, Ont., and required Ludwig not only to battle the bear, but cut a hole in lake ice and go for a frosty dip. 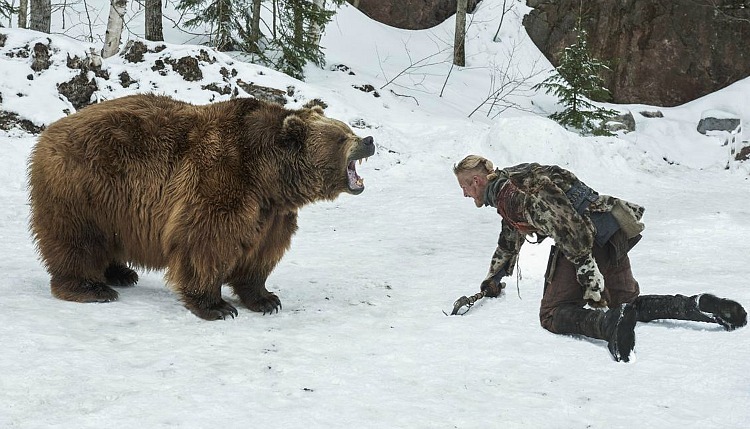 Looking towards the next section of episodes, fans will see a changing of the guard, story-wise, as the grizzled, battle-worn Ragnar and Floki step back from the spotlight in favour of Bjorn and his brothers, Hvitserk (Marco Islø), Ivar (Alex Høgh Andersen), Ubbe (Jordan Patrick Smith) and Sigurd (David Lindstron) stepping into history. It’s five years since Ragnar abandoned Kattegat and not everyone is happy to see him back.